Just as the lightning shatters the oak to leave a pillar of flame in its wake, Aventis Firestrike is not only the stormbolt, but its burning aftermath, His power over the magic of the realms comes from a glowing coal of anger deep within his chest, which his many acolytes say is the source of his famously foul temper. When the Shyish necroquake cascased across reality he convinced his kindred spirit, the Tauralon Loithar, to return with him to his homeland; since then Aventis has won such acclaim that Sigmar has sworn him the Magister of Hammerhal. 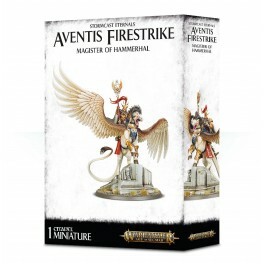 This multi-part plastic kit contains the components necessary to assemble Aventis Firestrike, a Lord-Arcanum on Tauralon. Armed with the Staff of Hammerhal, he rides a specific Tauralon known as Loithar – this great beast has an impressively wide wingspan, with a dense skull and thick curled horns. This mount doesn’t require a huge amount of armour, with but a few pieces of metal around its legs and a chestplate featuring scrollwork and a sigmarite comet. Aventis himself wears the Thunderhead Crown, an ornate helm featuring lightning bolt-shaped spikes, and carries spirit flasks as part of his sigmarite armour – this is covered in detailed iconography, as is the sword and scabbard at his waist. Loithar is modelled with one hoof standing atop the ruins that form part of the base. The kit also contains the components needed to assemble an extra Lord-Arcanum on foot – armed with an aetherstave and spirit flasks, he stands atop a base of sigmarite ruins, and can be modelled casting a lightning orb. This kit can optionally be used to assemble an unnamed Lord-Arcanum on Tauralon instead of Aventis Firestrike – this has its own head, shoulder and leg options for the Tauralon. This kit comes as 67 components. Supplied with a Citadel 100mm Round base for the Tauralon, and a Citadel 40mm Round base for the optional Lord-Arcanum on foot.